On form 1040 you have to make this entry on Schedule C (self employment). Add up all 1099-K amounts and enter the total on Form 1040, Schedule C, line 1a. Don’t forget, 1099-K amount is part of your gross receipts. If you received payments by check or cash for the same business, you need to enter those items on line 1b, as the other part of your gross receipts. The total of line 1a & 1b becomes the total of your gross receipts. If you are the only member in the partnership, file your business income on Form 1040, Schedule C. You don’t need to file Form 1065. The only thing you need to do is enter the name of your LLC and the ID number on Schedule C. Form 1099-K amount is reported the way I described it above. 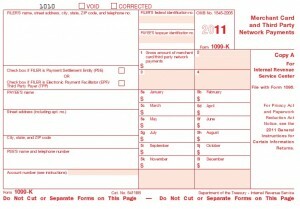 If your Partnership, LLC, has more than 1 member, for 2011 tax year you add your 1099-K amount with your other receipts and you need to make only 1 entry on line 1b which is your gross receipts. Don’t forget, 1099-K amount is part of your gross receipts. Form 1120, 1120S for 2011 is treated the same way. 1099-K amount added together with all other receipts and should add up to the gross receipts for the year. WONDERFUL Post.thanks for share..more wait …..